Feyenoord youth product Van la Parra moved abroad in 2008. He signed a 4-year contract at Stade Malherbe de Caen until 2012. In his first foreign season, the youngest player of the first equipe played just two matches in the Ligue 1. In August 2011 he and the club agreed in mutual consent to cancel the contract. Van la Parra played most times for the Reserves and saw no future at the club. He returned home and signed a contract until June 2012 with an option for another season at SC Heerenveen. In March 2012 the club and player agreed a contract extension in Fryslan until 2014. At the end of his contract, he moved abroad again to sign on a 3-year deal at English club Wolverhampton Wanderers. On 26 November 2015, Van la Parra signed a loan deal with fellow Football League Championship club Brighton & Hove Albion, initially lasting until 2 January 2016. He returned to the Wolves after his loan expiration. Van la Parra played six matches, scoring twice for Brighton. 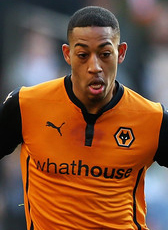 On 11 March 2016 Van La Parra signed on loan for fellow Championship side Huddersfield Town for the rest of the season, with the move becoming a permanent deal in the summer. Van La Parra signed a three-year contract until 2020. In January 2019 he was send on loan for the rest of the season to Middlesbrough.